Universities minister Jo Johnson seized quickly on the Centre for Policy Research’s August 2017 report that 4.8% more disadvantaged students were at university since the fee cap increase to £9,000 in 2012. Inevitably the big expansion of university education has drawn more disadvantaged students into higher education, so it is not surprising to see some uplift in numbers of disadvantaged students. But much is changing. The numbers applying to go to university this year has dropped dramatically and many prospective students are quoting the student debt burden as a prime factor. In England the decline is by 6% and the number of older applicants has fallen further – 9% for 19 year olds, for example. This drop is higher than in Scotland where university is free. It is no surprise either that this coincides with the scrapping of the maintenance grant paid to poorer students to be replaced by a loan. Previously students from families with annual incomes of £25,000 or less received a full grant of £3,387 a year. This means poorer students needing this additional loan will find themselves around £11,000 more indebted at the start of their careers than contemporaries, having paid 6.1% interest on the loan while at university, if starting in September 2017. At the other end of the scale, the richest 10% of students are not taking up loans because they, or more usually their parents, do not want them to start their careers burdened with debt. The dinner party conversation around the tables of well-heeled parents of students is of how they have decided to pay fees and maintenance for their offspring rather than see them start working life with a debt millstone. What this means is that the richest graduates are able to start working life and all that goes with it – paying rent, saving for house deposits, making pension provision – without the 9% tax penalty shouldered by their poorer contemporaries. An economist might call that progressive because richer parents have paid but it is hardy socially progressive. So why are fewer students going to university in 2017, especially older students, and why are more rich students deciding not to take out loans? 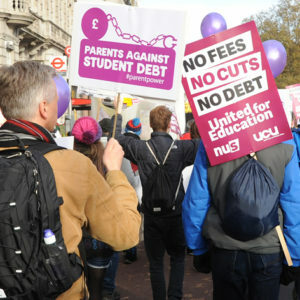 One explanation heard frequently is that people have become much more aware: the high levels of student debt, tuition fees and vice chancellors’ salaries have featured in the news at the same time as increasing scepticism of the value for money of a university education. That this story took so long to get going is because it was not until late summer last year (2016) that the first tranche of graduates who started their courses in 2012 received the shock of their first student loan statements showing debt of over £40,000, including interest of over £4,000. It was then that most students and their parents realised what they had got themselves into. It will be very surprising if these changes – and a wider understanding of what entering the university system really means – do not lead to a reversal of widening university participation, among poorer students especially. The big flaw in the argument that graduates should pay because they end up earning more is that very many do not because the graduate premium no longer universally applies. Data from the Department for Education that shows graduates earning £9,500 more than non-graduates is inevitably based on old data and importantly on graduates of all working ages including those who graduated decades ago when the graduate premium did exist. We can expect that figure will be very different in 10 years’ time when the current crop of lower-earning graduates is in the figures. Average graduate starting salaries are now around £20,000 – far below average wages of £27,000 and a long way from the premiums of decades ago when they were considerably higher than the average wage. There are plenty today whose earnings start low and will not progress far beyond the loan repayment threshold of £21,000. Yet these individuals and their families will still be caught in the 9% tax trap and bear the psychological weight of a debt burden that will be impossible to pay off at average earnings (see Myth 3). This is not to argue against an equality of investment among all young people whether they enter university or not. Doing more to invest in education and skills development outside university would be good for young people and is key to boosting national productivity as well as the well-being of individuals and society. Getting better value for money from universities is essential, and they need to be seen to be doing so. They have spent an unseemly proportion of the student fee hike bonanza on building projects (up 43% in 2013, the year after the fees hike) and vice-chancellor pay, which has gone up 56% in ten years. At the same time, requiring graduates to make a fair investment in their own education is reasonable but the balance is wrong now because the debt and tax burden on young people going to university is unfair.